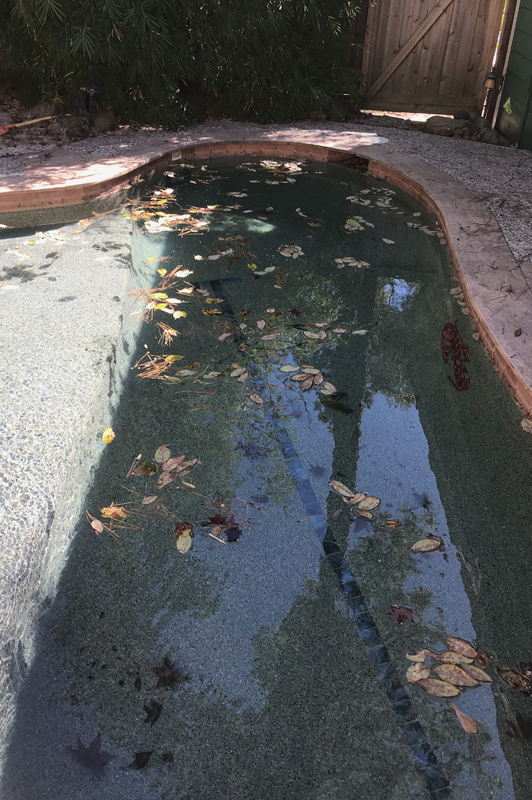 Cleaning and draining your pool (if necessary) is a big part of getting your pool back in shape after heavy rains. 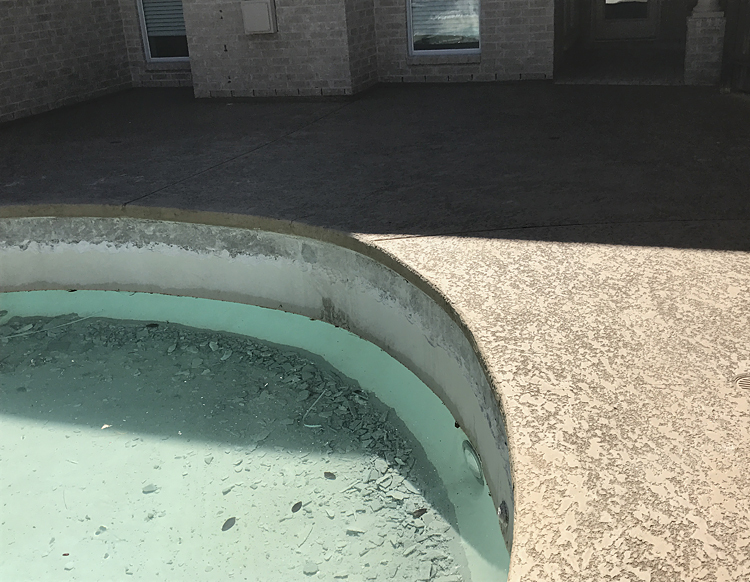 But just because your pool is glistening does not mean that its recovery from Hurricane Harvey is complete. 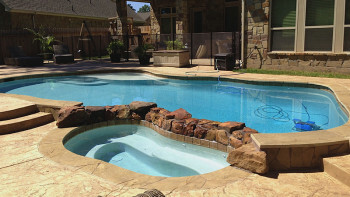 For your pool to truly be in tip-top shape the water chemistry must be in balance. 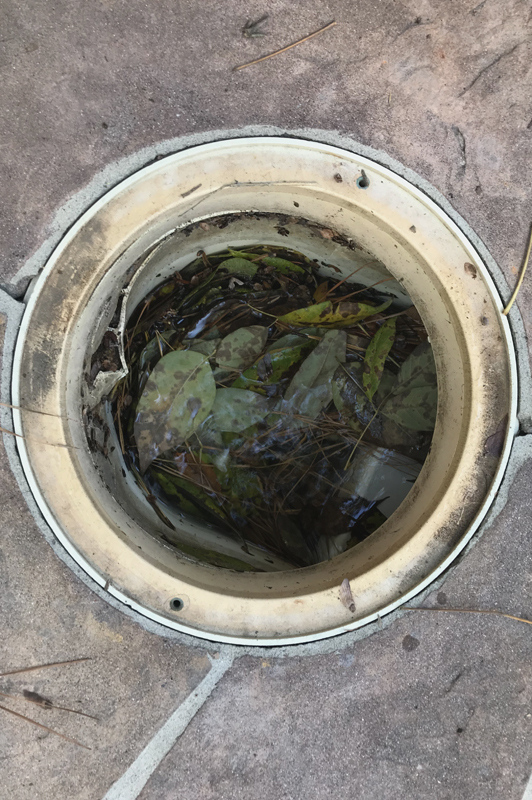 In this article, we’re going to take that newly cleaned pool water and make sure it’s chemically in balance. If it isn’t, we’re going to show you the importance of that balance and how to achieve it. 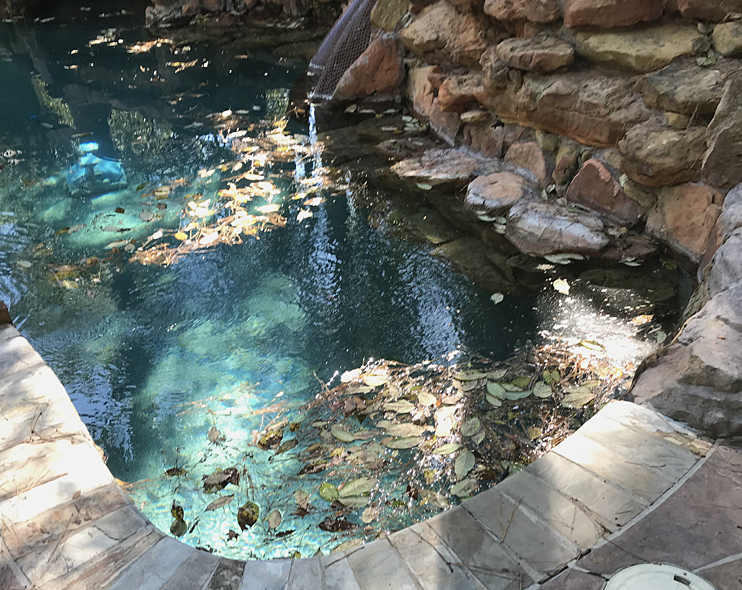 The pool in the picture above looks glistening and ready to go, but having clean, aqua pool water doesn’t necessarily mean that everything is up to snuff. 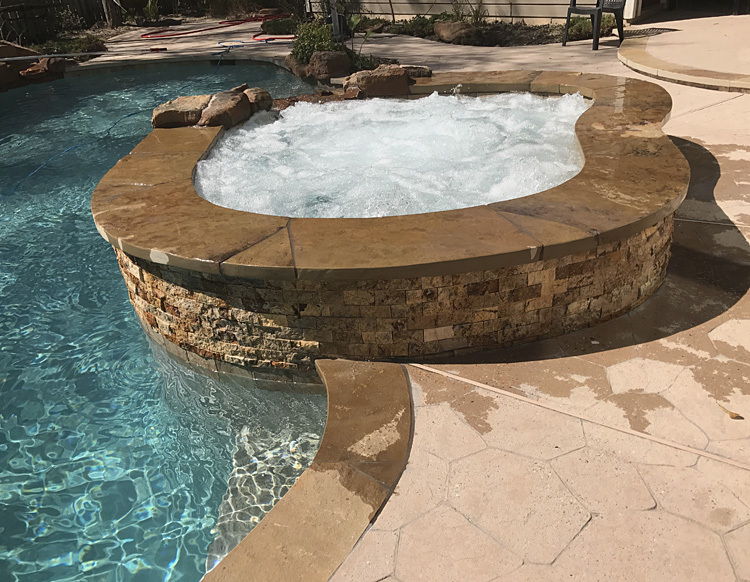 There are three areas of water chemistry which are extremely important in the well-being of your pool — the amount of cynaric acid, the calcium content and the alkalinity. 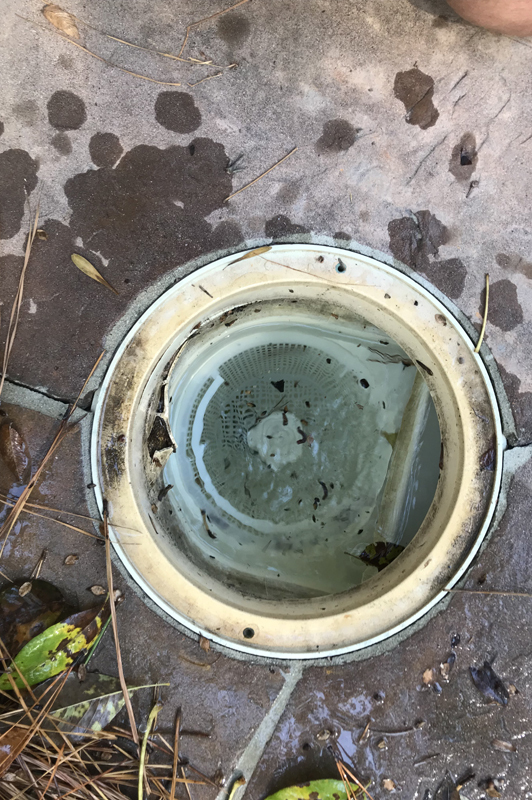 It’s very important to continuously check these metrics and not simply stop and be satisfied once the water is a desirable color. 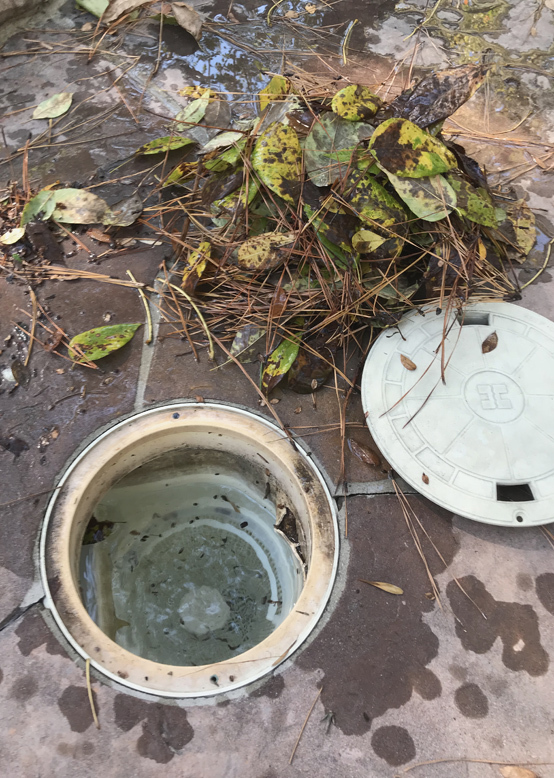 If you don’t check them, especially when dealing with a rain and flooding event such as Harvey, you leave your pool susceptible to algae blooms and scaling. 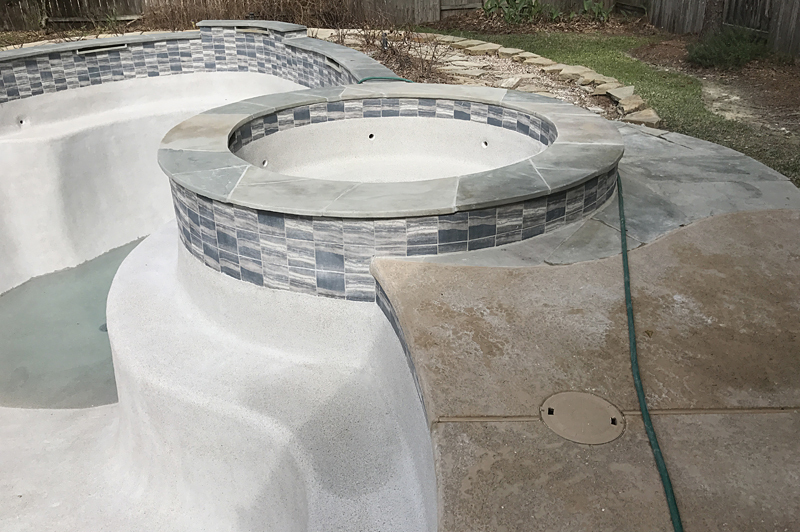 We detailed these measurements in an article we did on IntelliChem. 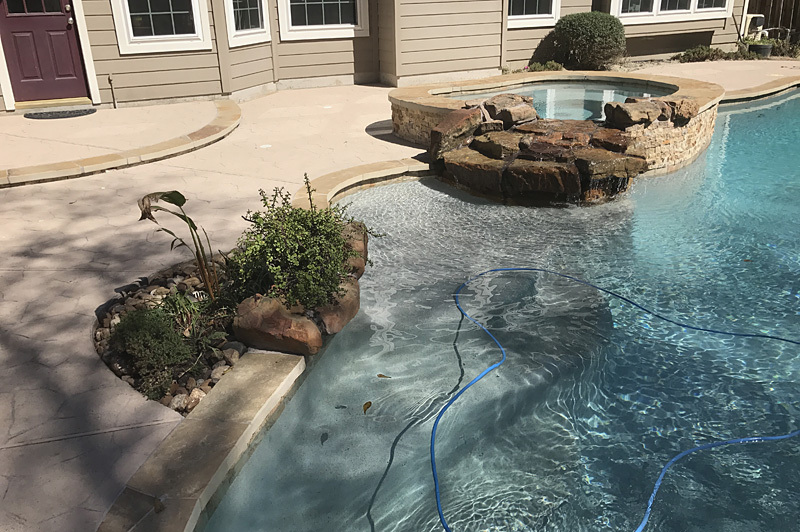 While the IntelliChem system will let you know what the measurements are, the cynaric acid and chlorine will have to be applied separately. Of the three measurements, cynaric acid might be the most important. Cynaric acid acts as a stabilizer, protecting the chlorine from getting burned off by the sun and losing its potency. Cynaric acid operates in a similar way that sulfates do in wine or homogenization does with milk. 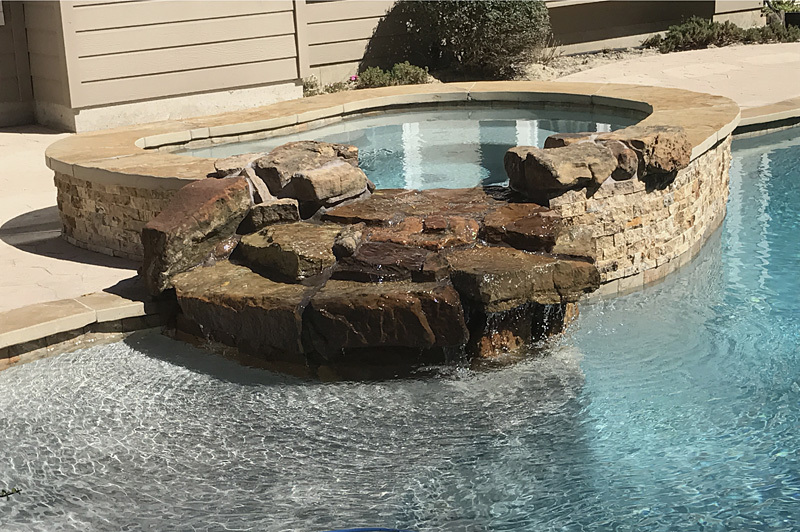 It keeps the chlorine fresh so it can do its part to get your water in balance. 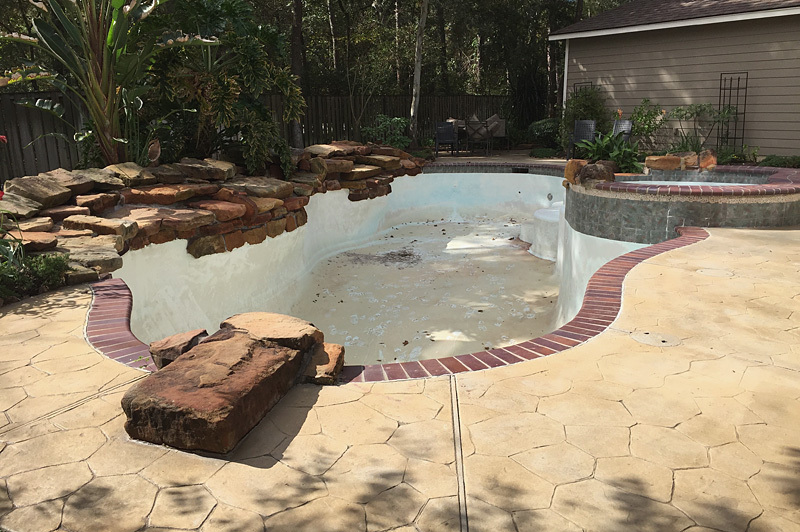 Having 30-35 parts per million of cynaric acid will help chlorine do its thing and help with calcium and alkalinity. 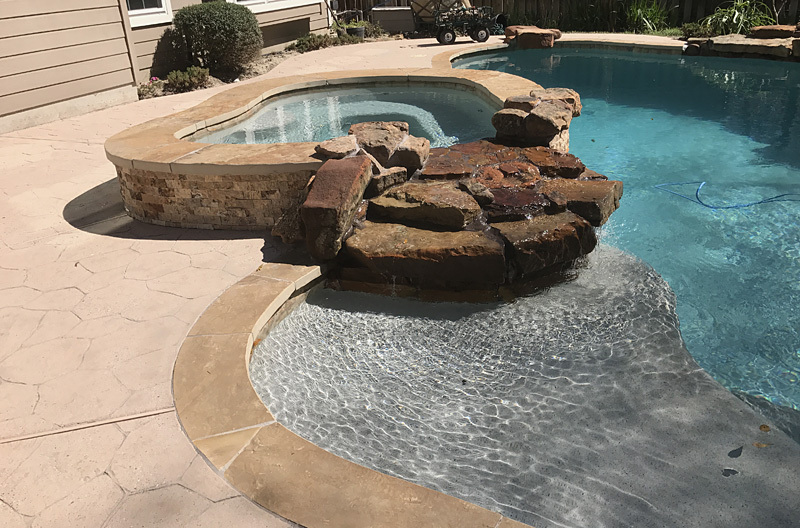 If you simply shock the pool every so often or throw in chlorine tablets without paying attention to the cynaric acid output, you’re likely to get the dreaded algae and scaling. And that’s not a good time. 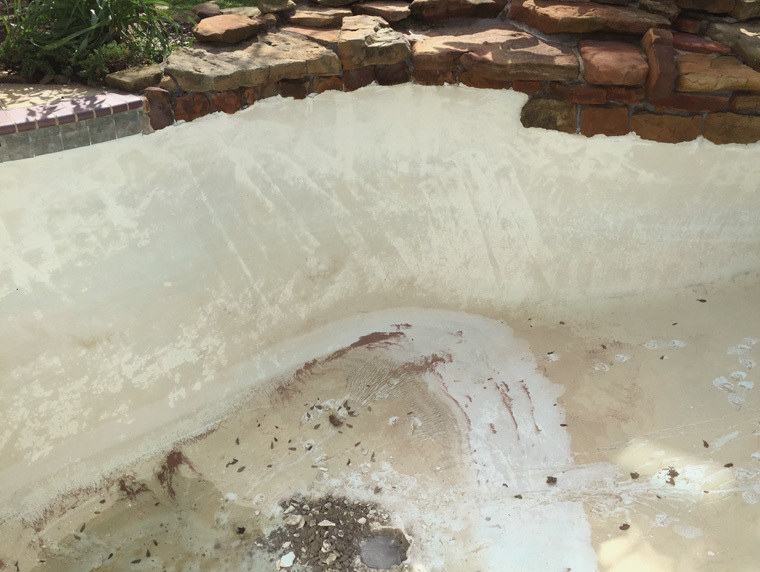 Keeping tabs on calcium is extremely important, as too little calcium will cause the water to eat away at the plaster while too much calcium will cause scaling on walls and on the pool surface. You want to keep the calcium between 200 and 400 parts per million, with 250 being the sweet spot. 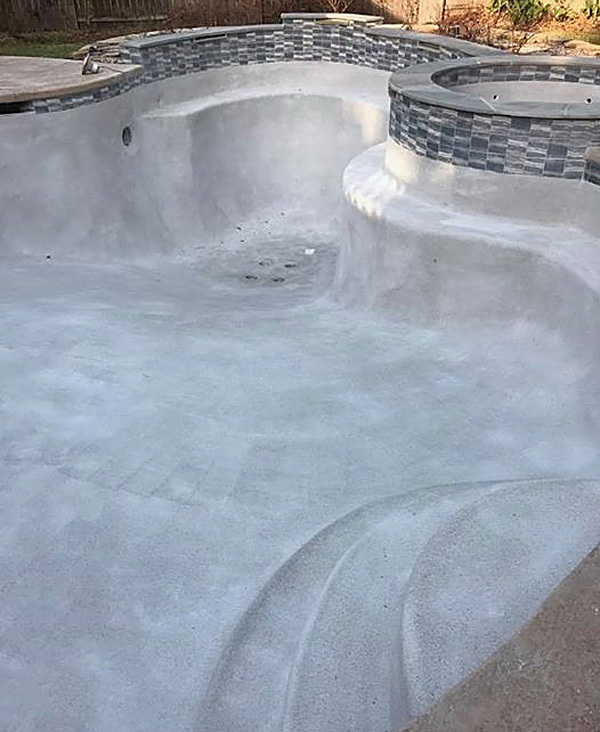 As far as alkalinity, keeping it under control is necessary to prevent corrosion of the metal equipment in the pool and staining of the plaster. The range for alkaline substances is 80 parts per million to 200 parts per million, with 120 being the ideal amount. 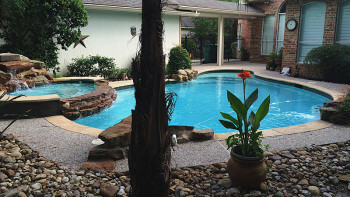 You should also aim to have the pH in your pool between 7.2 and 7.8, with 7.5 the prime target. 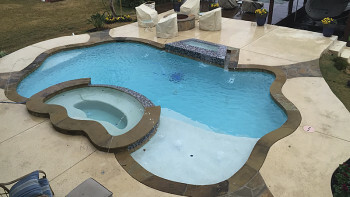 Chlorine, with cynaric acid as a lead blocker, can get these elements to where you need them to be. 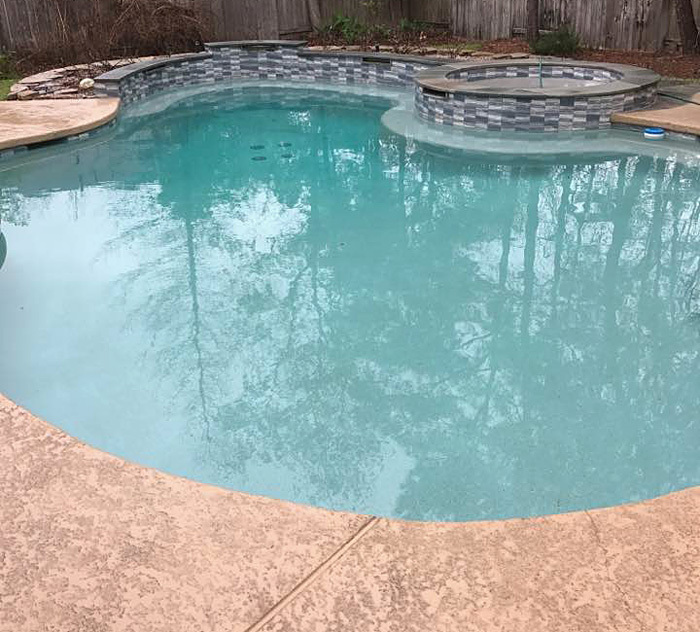 For best results, have your free chlorine at 3.0 parts per million. As always, feel free to contact us with any questions about these matters. 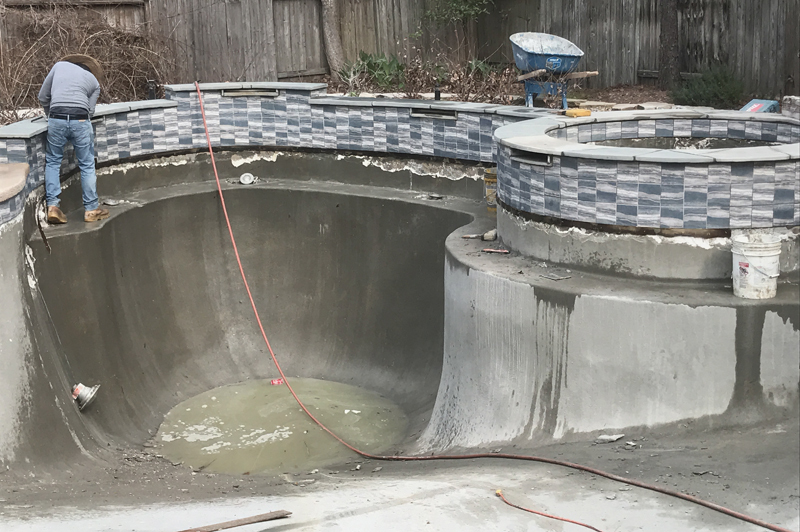 We touched on the Groner pool replastering in a previous post, as Matthew Groner graciously allowed us to use photos he took of the remodel. 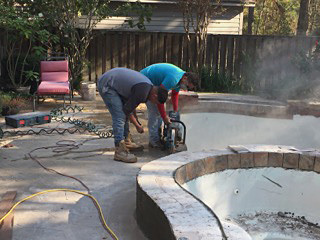 But we also took a few photos of our own to document the transformation of the old Groner pool to Groner pool 2.0. 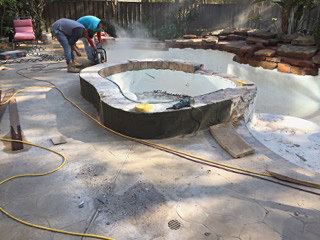 Along with building brand-new swimming pools, we also look to remodel existing swimming pools. 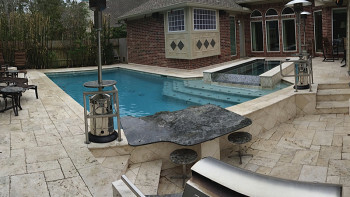 Think of remodels like a swimming-pool makeover. 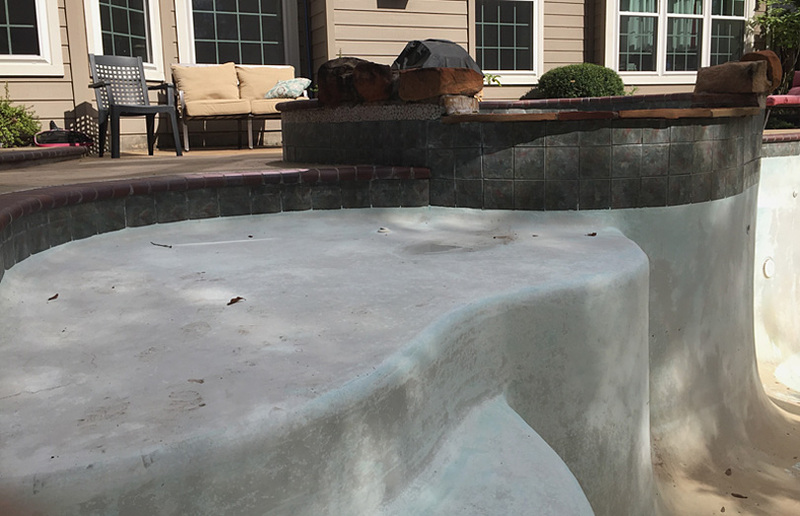 Take your old swimming pool, alter it a bit and it’s as good as new. 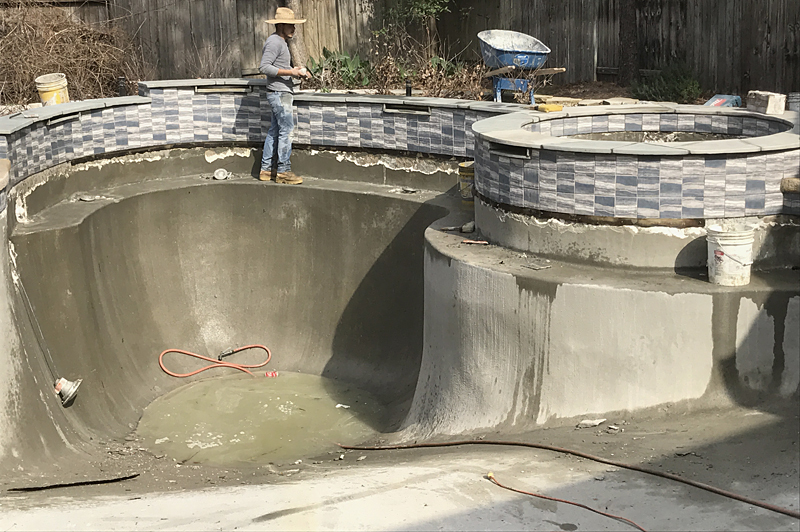 Remodels aren’t easy and aren’t able to be done on every pool, but when they are, they can inject new life into your backyard. 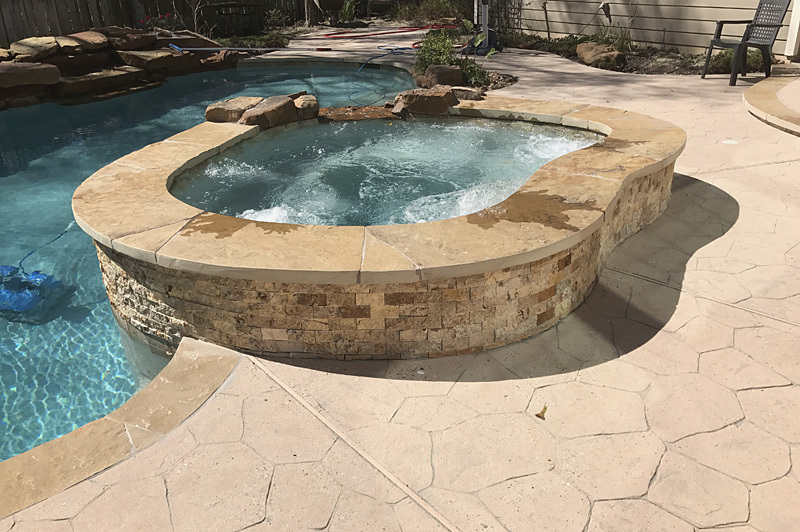 Here are some pictures of a remodel that we did in the Cochran’s Crossing neighborhood in The Woodlands. 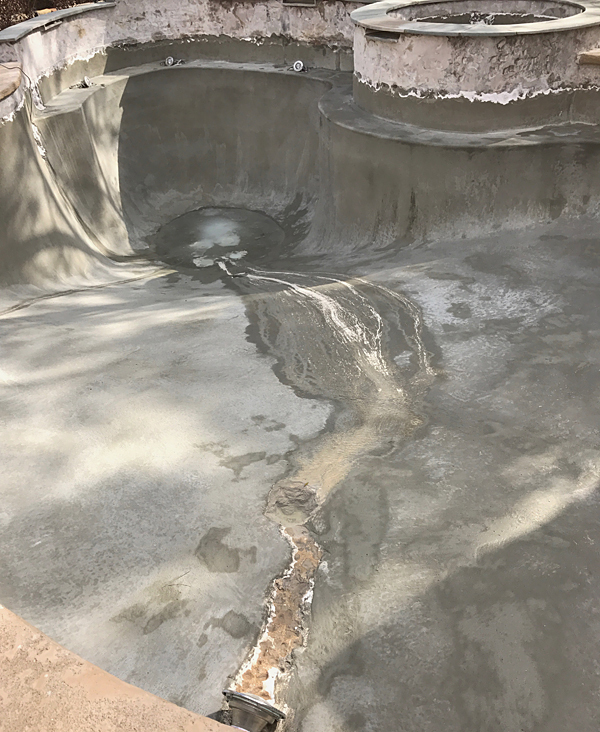 Here are some initial photos of what the pool used to look like. 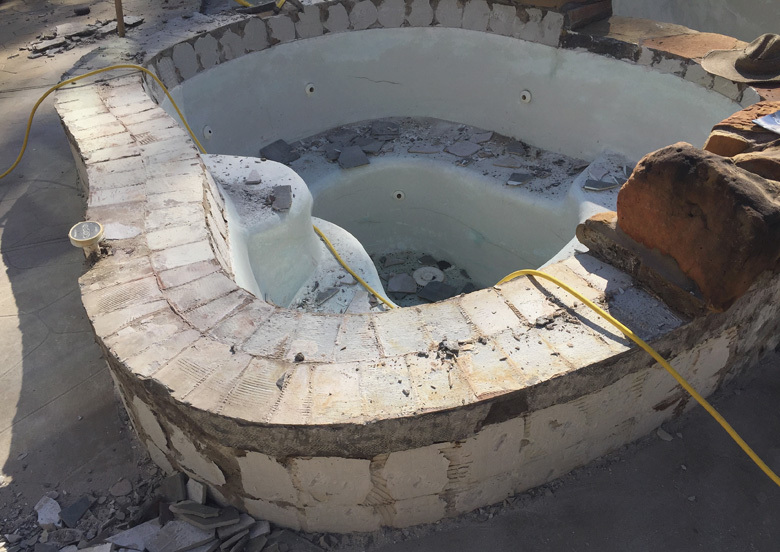 Notice the brick coping on the spa and encircling in the first picture and the weathered tile in picture No. 2. 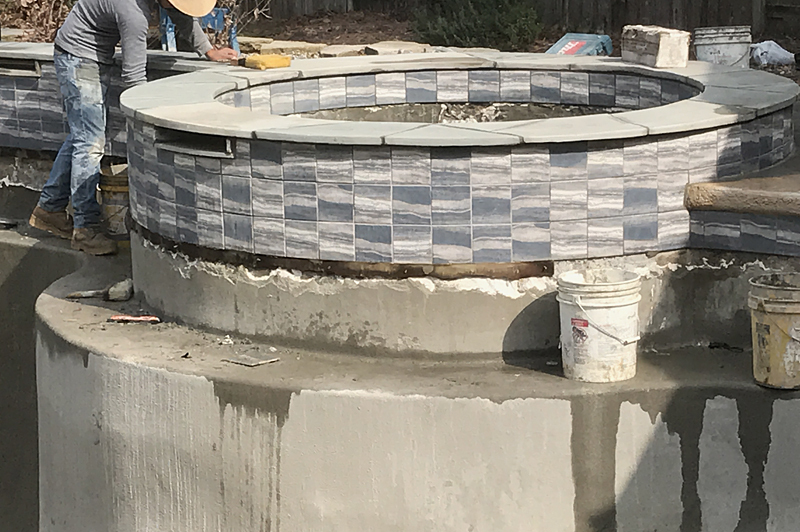 The customer was looking to trade the brick coping for flagstone coping and upgrade from the tile, along with getting a plaster facelift. 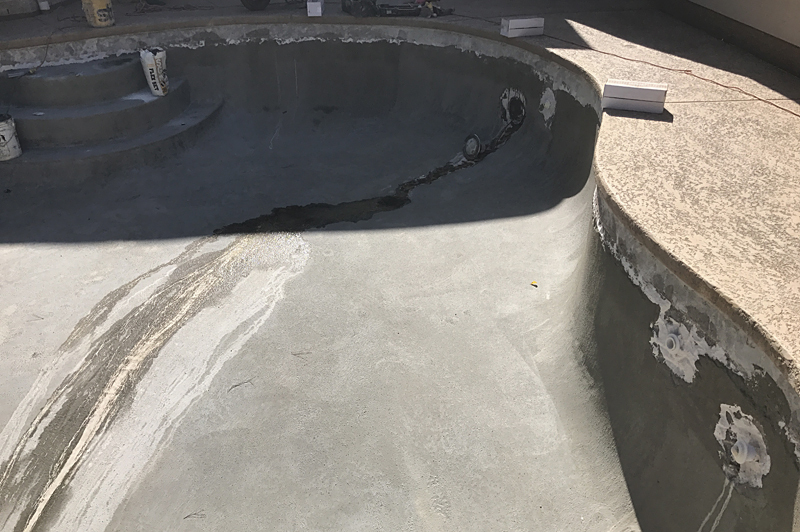 These pictures give you an idea of what we were originally working with. 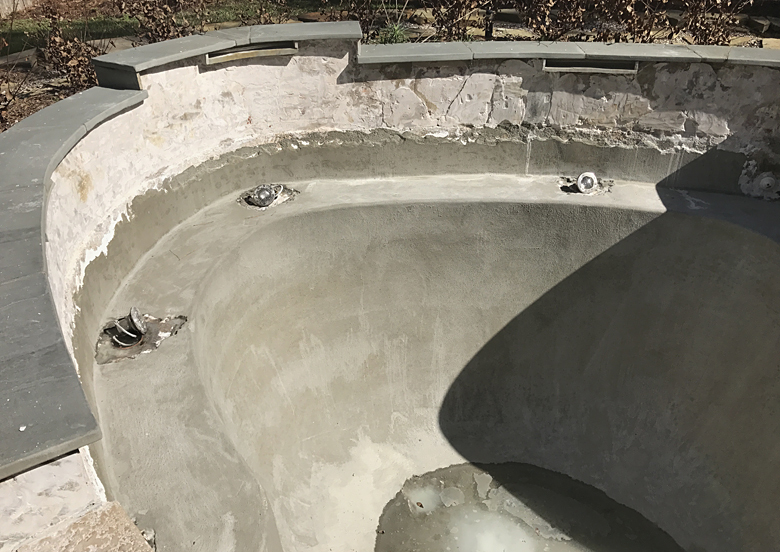 One of the first things we did was rip out the coping all around the pool and the spa. 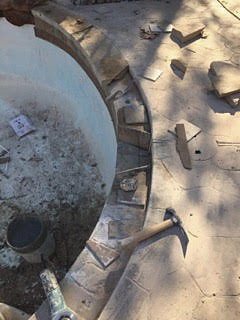 We also stripped the tile that encircled the hot tub. 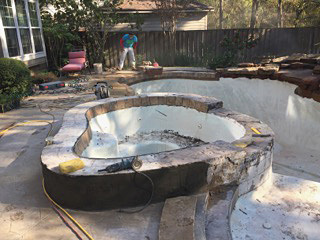 Here are some pictures of us “doing out with the old.” The first two deal with the coping around the pool while the rest concentrate on the spa. 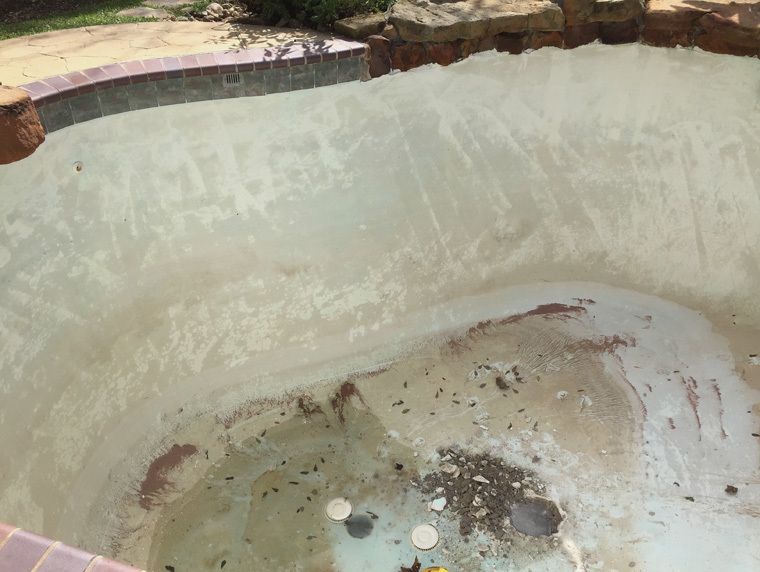 As mentioned above, we also resurfaced the pool, which included replastering. 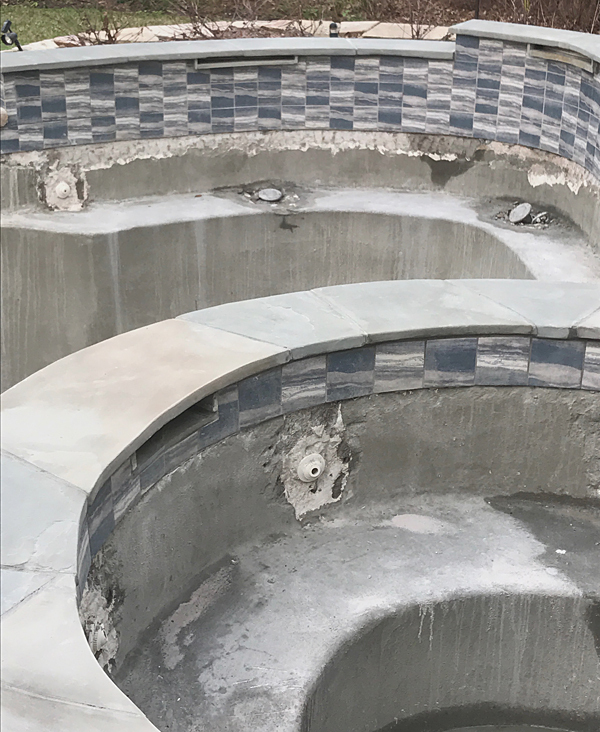 Notice the holes in the bottom of the pool. 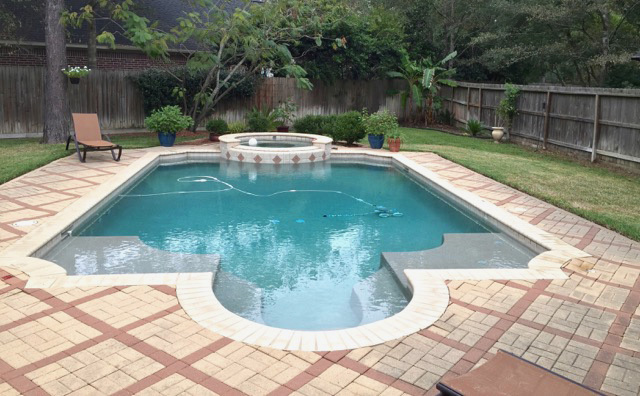 They are called weep holes and are essential in surfacing a pool because they don’t allow the shell to “float” away. You can read more on that concept here while enjoying these pictures. 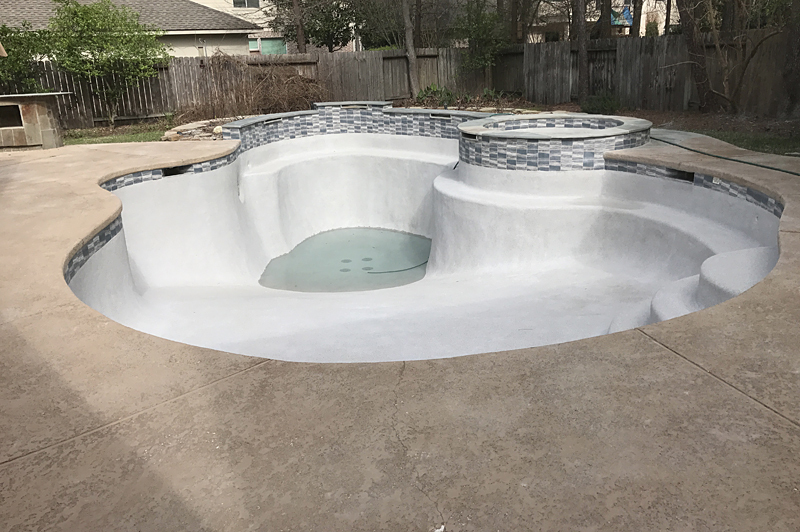 Now that you’ve seen the process, here are the results. 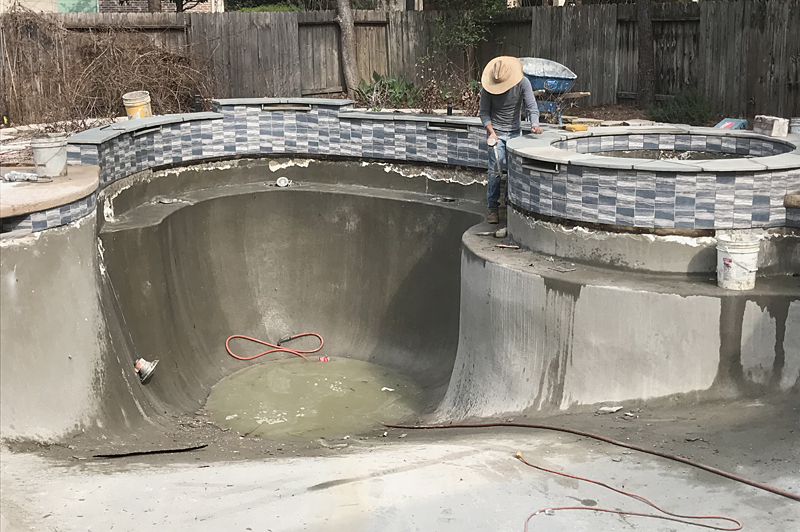 As you’ll notice, the brick encircling the pool and the shelf of the spa has been replaced with flagstone, and the weathered tile along the sides is now eye-catching brick. 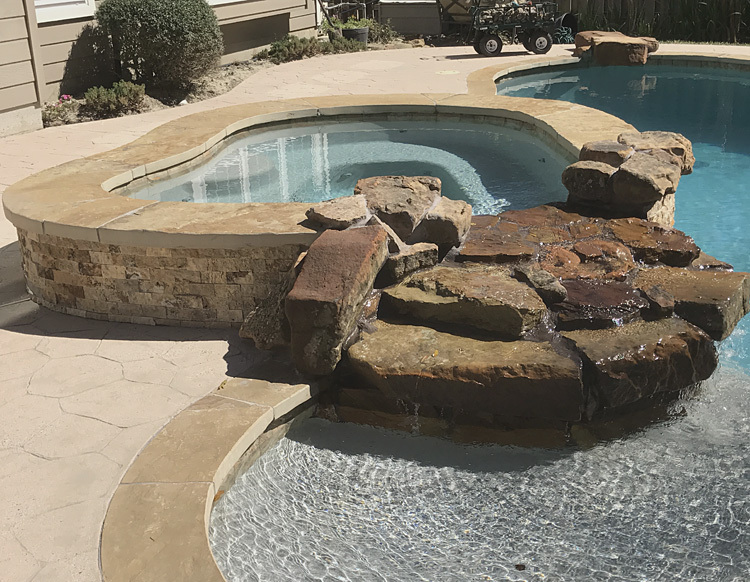 We also added a pretty sturdy rock formation alongside the spa. 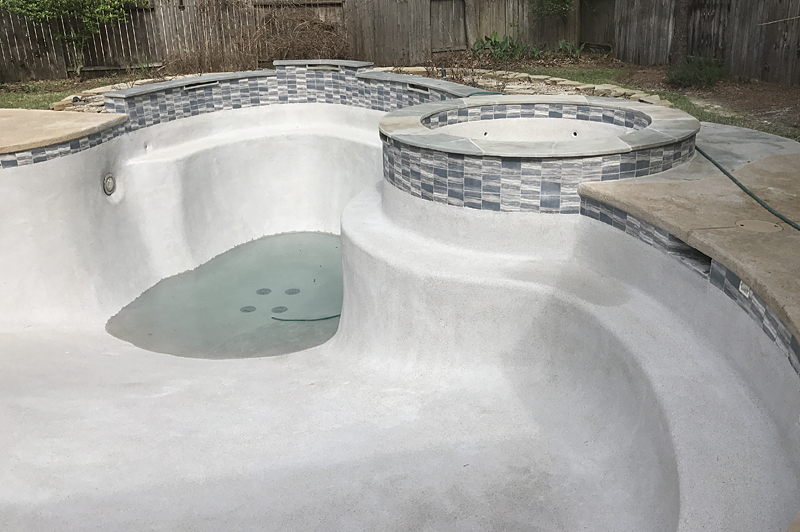 That goes with a nice plant area alongside the edge of the pool, and we resurfaced the pool with a nice new layer of plaster. 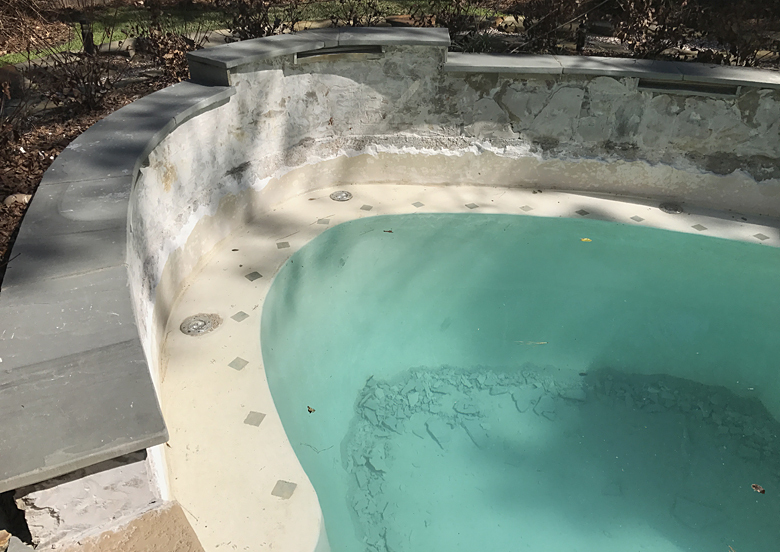 In case you were worried, the spa works just like new. We even tried it out! 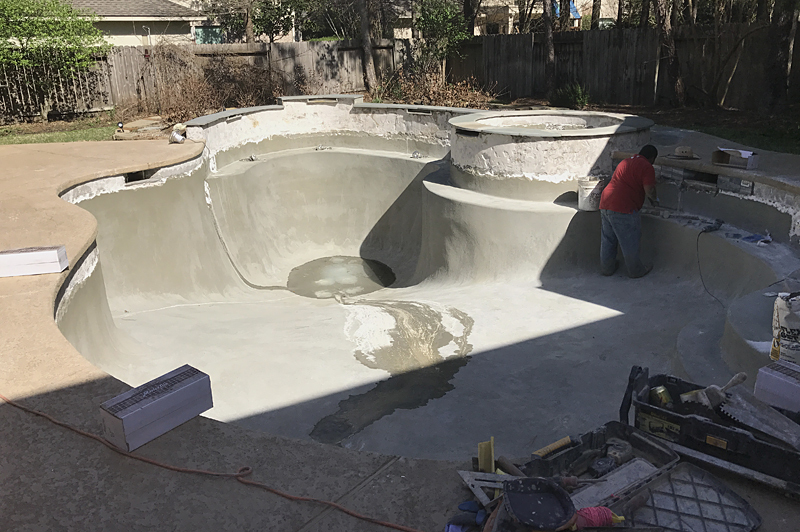 We’re feeling pretty photo happy at Ultimate Pools lately, so here’s a look at a couple of pictures that a customer shot from a replastering job in The Woodlands. A hearty thank you to Matthew Groner for the photos. 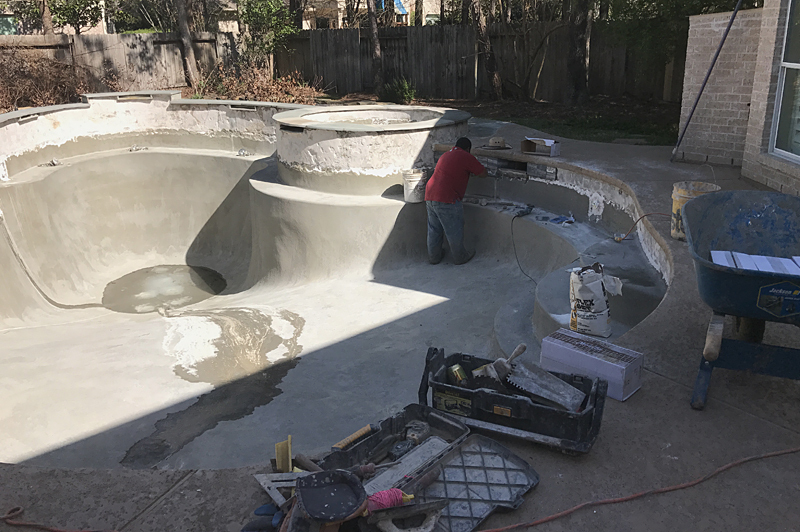 Update: The replastering is finished and the pool is filled, just in time for the beginning of swim season.